The man who killed four people at Ozar Hatorah Jewish school in Toulouse had a camera around his neck and may have filmed the scene, France’s Interior Minister Claude Gueant says. Claude Gueant said the camera was one clue helping police build a profile, as the manhunt intensifies with the area on the highest level of terror alert. Police have linked the attack to two shootings last week in which three soldiers of North African descent died. The same gun and the same scooter were used in all the attacks. French schools held a minute’s silence on Tuesday. It is the first time in the country’s history that “scarlet alert” has been declared. The measure enables the authorities to disrupt daily life and implement sweeping security measures. These include mixed police-military patrols and powers to suspend public transport and close schools. About 250 investigators are pursuing two main lines of inquiry – an Islamist motive or the far right. Three soldiers expelled from the army in 2008 for neo-Nazi activities have now been cleared of any involvement in the shootings. The three were members of the same parachute regiment in Montauban as the soldiers killed in the attacks on 11 and 15 March. Earlier, Claurde Gueant said inquiries had taken place “regarding soldiers who were kicked out of the army and who might want to seek revenge”. He added he did not know if the man had filmed everything. The camera “records wide-angle footage that can then be watched on a computer. I feel that that will reinforce the killer’s psychological profile,” the minister said. He went on to describe the killer as “someone who is very cold, very determined, very in control of himself, very cruel”. But there was no sign police were near making an arrest. The shootings took place as parents were taking their children to Ozar Hatorah school on Monday. A teacher and three children were shot dead, and a teenage boy was seriously injured. The man got off a black Yamaha scooter stolen in Toulouse on 6 March and “shot at everybody who was near him, children or adults”, according to local prosecutor Michel Valet. The dead were Jonathan Sandler, a 30-year-old rabbi and teacher of religion originally from Jerusalem, and his two sons, aged four and five. The fourth person killed was a seven-year-old girl, Myriam Monsonego, daughter of the head teacher. She died in her father’s arms. All the dead were dual French-Israeli nationals and will be buried in Israel on Wednesday. The bodies, which had been lying at the school for an overnight vigil, have now been taken to Toulouse airport for repatriation to Israel, via Paris. Initially, the killer used a 9 mm gun, but when it jammed, he switched to a .45 calibre pistol. Police say the .45 was the same gun used to kill three soldiers in two separate shootings in Toulouse and nearby Montauban last week. All three were of North African or Caribbean origin. The mother of a girl at the Toulouse school said she was angry with the authorities, who she said had not taken last week’s incidents seriously enough and had “lost time to look for this man”. All the candidates in the French presidential election have suspended campaigning. 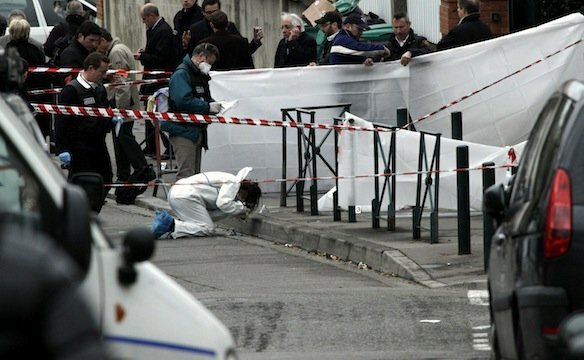 Toulouse city Mayor Pierre Cohen said the killings in Toulouse and Montauban were “racist, anti-Semitic acts”. “We can’t say for certain whether this is linked to the presidential election campaign,” Pierre Cohen said.